Renee Westerhout, Senior Account Director - Haig Barrett, Inc.
Who inspired Renee Westerhout to start a marketing career? Amanda Woodward, that’s who. [and if you don’t know who Amanda is, the answer is at the end of the bio]. Even though her love of marketing started from a TV show, Renee is the real deal. Renee has spearheaded many campaigns for large brands such as Clinique, Coca-Cola, Starbucks, Nike Basketball, Butterfinger, SweeTARTS and more for the last 10 years. She’s even won awards including The Webby Award in 2012 for a campaign she worked on at Saatchi & Saatchi for Toyota Motor Sales. Her MO is to help connect the dots for her clients between the consumer insights and strategies, in a way that delivers a connection between brands and their consumers. Not only has she been able to create campaigns to keep the brands she is working with top of mind through traditional marketing tactics, Renee also brings extensive experience working in the digital space. 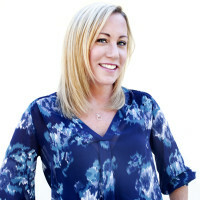 Most recently, Renee was the Director of Social Media at Threshold Interactive where she helped garner 27 million impressions for one of her client’s during an activation alongside a Primetime awards show, and helped the brand take 84% share of voice in mentions in the brand’s category. Renee exudes passion when she talks about marketing. But that’s not her only love. She is also an avid marathoner, running in 14 marathons including the Boston Marathon in 2011. Besides running, Renee is an adventure junkie. From the places she travels to the culinary delights she samples from around the world, Renee is always up for trying new things. And her superpower? That’s easy. Teleporting from place to place is her number one choice. This way she can travel to Greece, eat some delicious Mediterranean food, and maybe even run another marathon (or two) without having to hop on a plane. ** Amanda Woodward is Heather Locklear’s character in Melrose Place.